Police in Gilford, New Hampshire, are asking people to be careful after a herd of bison got loose. 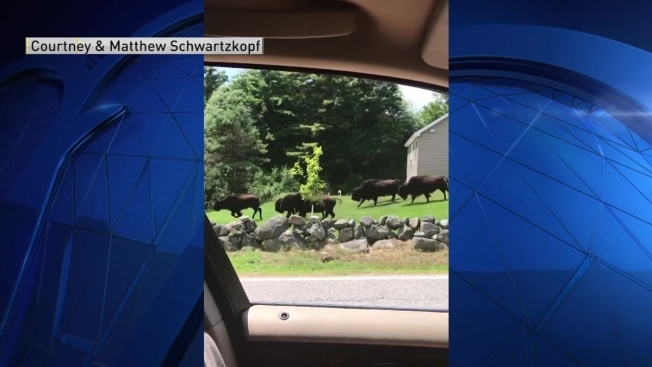 A herd of buffalo are all back in custody after escaping from a farm in Gilford, New Hampshire. Police in Gilford warned drivers to be cautious in the area of the Route 3/11 Bypass and Route 11A areas Tuesday afternoon. Authorities said the herd got loose from a local farm. Although most had been accounted for, approximately 15 bison adults and calfs were still missing by 6 p.m., and the farmer said they may be laying down in woods to rest. Drivers had been asked not to approach the bison or blow car horns to avoid startling them.